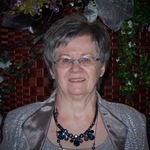 Odyle Toupin Obituary - Haileybury, Ontario | Buffam Leveille Funeral Home Ltd.
Toupin, Odyle Angeline [Robert] - It is with sadness that the family announces the death of Odyle Toupin, at the age of 79. Mrs Toupin died peacefully, surrounded by her family, at Elisabeth Bruyère Hospital in Ottawa on Thursday, July 12, 2018. Odyle was an impressive and ambitious woman. She worked as a teacher from 1957 to 1995 while managing the Pineheights farm with her husband. When she retired, she continued her duties as secretary and owner of the family farm. She spent a lot of time developing different interests and hobbies such as: playing Scrabble, playing the violin, keeping abreast of modern technology and traveling. Many will remember her as a pianist for the Earlton Choir. Passionate about genealogy, she has created wonderful memories that have allowed her to renew beautiful friendships. Predeceased by her husband André Toupin in September 2007, her parents Charles and Éléonard (Baril) Robert, her brother Gilles, her son-in-law Robbie and some brothers-in-law and sisters-in-law. She is survived by her beloved children: Jean-Marc (Nicole Lavallée), Denis (Françine Laplante), Natalie (Dino Loranger) and Sylvie (Alain Goudreault); her nine grandchildren: Mélanie, Véronique, Vanessa, Daniel, Jocelyn, Josiane, Chloé, Emma and Klara; and her 7 great-grandchildren: Preston, Avery, Everett, Jenessa, Ayden, Liam, Ryan. She also leaves her sisters, brothers, several sisters-in-law, brothers-in-law, nephews, nieces and friends. In keeping with her wishes, the family will receive family and friends at St Jean Baptiste Church in Earlton on the following dates: Tuesday, July 17, 2018 between 2 and 4pm and between 7 and 9 pm; and Wednesday, July 18, 2018 between 9:30 and 10.30am. The funeral mass will be held on Wednesday, July 18, 2018 at 11:00 am. As an expression of sympathy, donations can be made to the Palliative Care Unit at Temiskaming Hospital or the Heart and Stroke Foundation. To offer your condolences, light a commemorative candle or make a donation, please visit our website at www.buffamleveille.com.